The Sherwood Park Apartments provide comfortable and affordable holiday accommodation in a tranquil and peaceful setting. You are assured of a warm welcome and the highest standards. The Sherwood Park Apartments consists of ten one-room self-contained holiday apartments set in lush tropical gardens, with wonderful views over Tobago’s beautiful green hills and out to the ocean. Our central location is within a few minutes drive of Tobago’s most popular beaches, restaurants, shops and sightseeing attractions. We are ideally located as a base from which to explore every corner of this beautiful island. 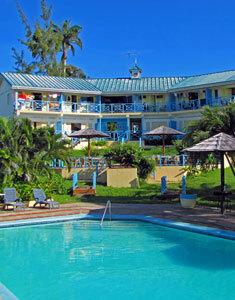 Naturally our staff will be delighted to help you plan and arrange excursions and to make the most of Tobago. Sherwood Park Apartments - Friendly, Affordable, Relaxing!